the tough lose 6 pounds and 6 inches in one week!! It wasn’t even a full week, just 6 days. And then the tough have a little breakdown of will (a little stress eating) due to stress but it’s all good. I’m past it, the glitch wasn’t major and my eyes are on the prize. 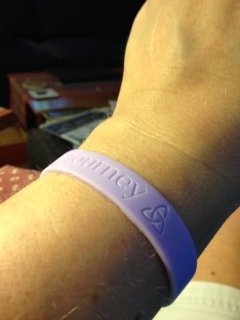 Speaking of prizes…I gave one to myself to wear for continued strength and support. I had a wristband made with the following words “Embrace the challenge.” Next to the words is a triquetra symbol. This is a symbol that appears in my mystery novel. I wish I took better pictures but you get the idea. I also wanted to report on last night’s dinner. I took a recipe idea from my friend Jen and made my own version. In a frying pan, I sautéed fresh sliced mushrooms with some evoo and a little minced garlic. Then I added a boatload of baby spinach and some halved cherry tomatoes. I used Italian seasonings and lamented the fact I didn’t grow any of my own herbs this summer. I whisked the cream cheese and milk to combine them, added s&p, and freshly ground parmesan cheese. 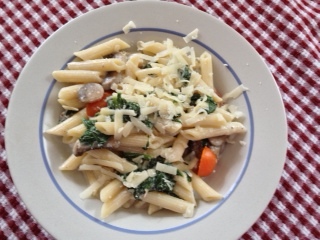 Drained the pennette and tossed them all together with a little freshly grated cheese on top. Next time I will definitely add some chicken or shrimp, as I was hungry fairly quickly after eating. But it was tasty, need to adjust the seasonings a little more. I’ve never been a huge fan of pasta, having grown up in an Irish-influenced household. We ate meat, chicken or fish, potatoes and a veg. I’m working on a system to make dinner prep easy for me when school starts up in September. I will let you know more about it as the ideas come together. This journey is one of the toughest I’ve undertaken, in a life with many trying journeys already, but I am bound and determined and so grateful for all of the support. This entry was posted in Celtic symbols, challenges, cooking, creativity, easy meals, Food, journey, perseverance, Uncategorized. Bookmark the permalink.